Curious about our approach to appliance design? Read Dwell‘s recent interview with Lou Lenzi, Director of Industrial Design for GE Appliances, to learn more. If you have visited the Monogram Design Center in Chicago at the city’s historic Merchandise Mart, then you might have been lucky enough to see our very own chef in action. Or even taste some of his delicious creations! The exceptional performance possibilities of Monogram appliances are brought to light by Chef Jon Liddell as he prepares meals and appetizers in the center’s beautifully appointed live kitchens. We interviewed Chef Jon to learn a little more about his background as a chef and his thoughts on Monogram appliances. Chef Jon: I grew up hunting and fishing in a small Michigan town where I truly found my passion for cooking. After culinary school in Grand Rapids, I started working as a private chef in the US Virgin Islands (St. Thomas). I worked with upscale clientele in these beautiful multi-million dollar villas by providing various wine pairings and food demonstrations. That’s when I started to alter my culinary career; I took the step from just being a chef behind the scenes cooking to a chef in front of people demonstrating how to cook. SRFD: How did you end up at the Monogram Design Center in Chicago? Chef Jon: After meeting a beautiful Irish girl from the south side, she convinced me to move back to her home town: Chicago, Illinois. With my experience dealing with high end homes in St. Thomas, joining the Monogram team felt like the perfect fit to merge my understanding of high end appliances and love for sharing my farm to table cuisine with consumers. SRFD: What is your cooking philosophy? Chef Jon: Simplicity speaks volumes- each ingredient has a voice in the meal you prepare and should be showcased to their full potential. Chef Jon: I feel like I always have some fresh pasta that can be ready at a moment’s notice. Oh, and Meyer lemons. SRFD: What have you learned from working at the Chicago Monogram Design Center? Chef Jon: I’ve learned to appreciate the manufacturing and sturdiness behind the Monogram appliances. Coming from a commercial background, I needed my appliances to be able to take a beating since I believe the appliances should change to work with your cooking style, not the other way around. I’ve cooked for more designers in the last three years than I ever thought, which really allowed me to appreciate the appliances visually. I now recognize how the aesthetic of appliances are just as important the as the functionality and Monogram does both without a doubt. Have you heard of Universal Design? If not, you will! It’s quickly gaining ground as a major design initiative. Universal Design refers to designing products and spaces that are simple and accessible for everyone regardless of their age, abilities or limitations. In the words of Steve Jobs – one of the early adopters of the discipline – “Design is not just what it looks like. 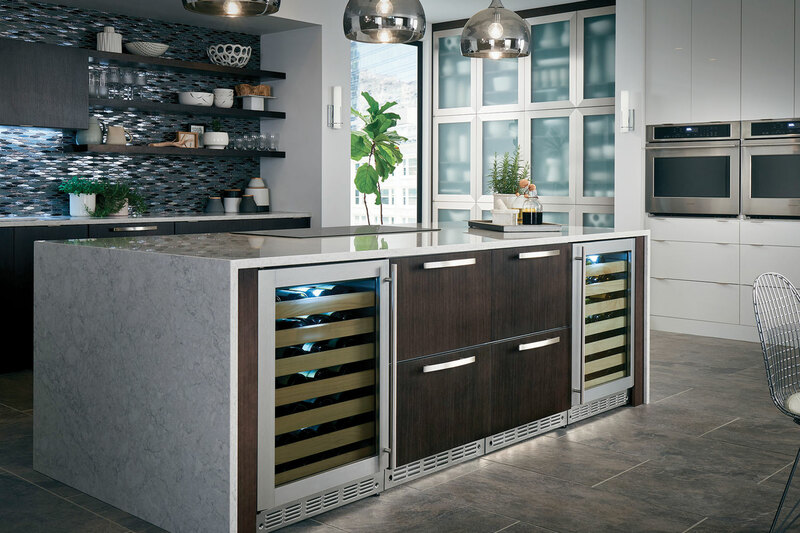 Design is how it works.” And kitchen designers today should look at a number of human factors when specifying everything from countertops, flooring and paint color to storage, lighting and plumbing. Appliance manufacturers are also supporting the goals of Universal Design by developing products like ovens that have built-in temperature probes with large visual displays and audible alerts to insure safer food preparation; dishwashers with customizable height adjustments and full extension racks to eliminate the need to bend down; and microwave drawer ovens for ease in food loading and unloading. Additionally, details such as large handles, easy-to-turn knobs, and bright interior lighting are being designed into products. The new Monogram French door wall oven combines design and functionality, and features one-hand opening and closing of both doors at the same time for ease of use. New induction cooktops use magnetic energy to transfer heat making them safer to use and easier to clean. Surfaces cool rapidly and surrounding areas do not get hot. And although these features are particularly helpful to those with limited abilities, they are “universal” in their appeal and usefulness. Induction technology allows instantaneous heat adjustment, assuring exceptional cooking results. In seconds, you can bring a delicate sauce to a boil and then quickly reduce heat to ensure a smooth and rich consistency. Inspired by the finest restaurant kitchens, Monogram’s French-door wall oven offers professional styling and distinctive touches inside and out. Each oven is built with premium-grade stainless steel and meticulously crafted by hand to make a delicious statement in any kitchen.